Preheat the oven to 375°F. Brush the cut sides of the squash with 1 tablespoon of the olive oil and season the cavities with salt and pepper. Place squash cut side down on a baking sheet and roast for about 30 minutes, or until just tender. Meanwhile, in a saucepan, bring 2 cups of water to a boil. Add the quinoa, cover and simmer for 10-15 minutes. Stir in the raisins and simmer, covered, until the water is absorbed, about 5 minutes. Transfer the quinoa to a large bowl and let cool. To prepare the stuffing, heat remaining olive oil in a large skillet over medium-high heat. Lower heat to medium, add leeks and cook, stirring occasionally, until lightly browned, about 10 minutes. Stir in apples and garlic and cook, stirring occasionally, until fragrant, 1 to 2 minutes then add kale, cover pan and cook until kale is mostly wilted, 5 to 7 minutes. Transfer mixture to a large bowl and add quinoa, sunflower seeds, herbs, maple syrup and vinegar. Season to taste with salt and pepper. 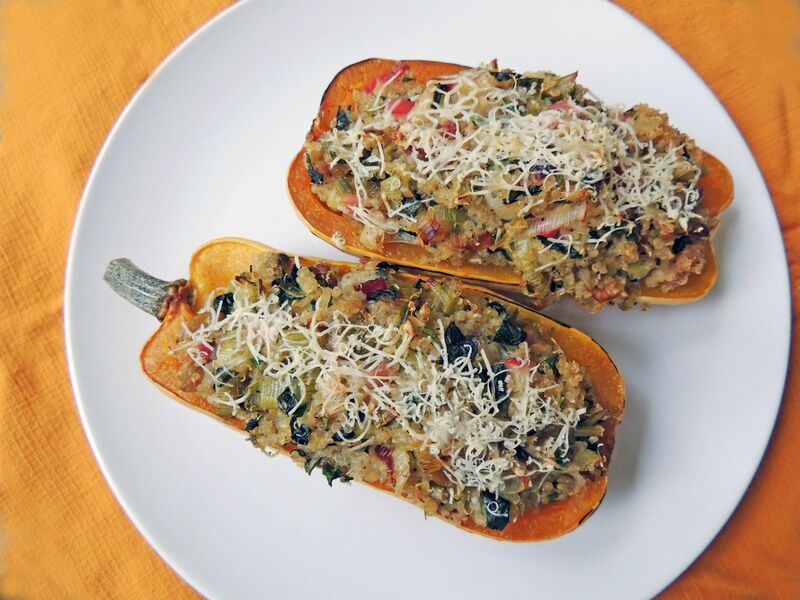 Fill squash halves with the quinoa stuffing, top with Parmesan, and bake for about 10 minutes. Serve as is or slice into quarters or thirds and serve as a side dish.